Obituary for Julia (Kawchak) Dzmura | Francis G. Ozog Funeral Home, Inc.
DZMURA – Julia, 98, of Johnstown, was called home to be with the Lord January 22, 2019, at Allegheny Lutheran Home at Johnstown. Born January 14, 1921, in Johnstown the daughter of Michael and Katherine (Krawchuk) Kawchak. Preceded in death by her parents; dedicated husband of 65 wonderful years, Joseph Dzmura; daughter, Lorraine A. Heffelfinger; brothers: John, Jim and Michael Kawchak; and sisters: Mary Jakell, and Ann Sinoply. Survived by her loving daughter, Cynthia A. James, husband, Stanley; grandchildren: Aric Heffelfinger, wife Erin; Jason Heffelfinger; Adam James, wife Megan; and Breanne James; great-grandchildren: Allison, Tyler and Camilla Heffelfinger; son-in-law, James Heffelfinger (husband of the late Lorraine Heffelfinger); and sister, Irene Trotz. Also survived by brother-in-law, John Dzmura, wife Dorothy and numerous nieces and nephews. She will be sadly missed by all. 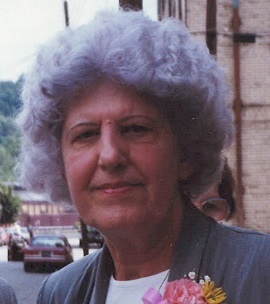 Julia was a lifelong member of St. Mary’s Byzantine Catholic Church. She enjoyed spending time with her children, grandchildren and great-grandchildren and family was everything to both Julia and Joseph. Julia not only enjoyed making every holiday very special, but each and every day she spent with her family was very special. Julia’s cooking and baking was enjoyed and loved by all. Friends will be received Tuesday, January 29 from 9 – 10 a.m. at the Francis G. Ozog Funeral Home, Inc., 710 Broad Street Funeral service will be held 10 a.m. Tuesday at St. Mary’s Byzantine Catholic Church, Msgr. Raymond Balta officiating. Committal will take place at Richland Mausoleum. The family would like to express their deepest gratitude to the members of the Personal Care staff of the Lutheran Home and Interim Hospice for the exceptional loving care they gave to Julia.